I wasn’t even born yet in the 50’s! But my latest dance “Danced All Night” is a song from the 50’s. If we were to turn back the clock and go to back to the 50’s, we would all be so lost! Remember the first black and white TV, Vespa scooter, jukebox and vinyl record players… yup, that’s the era! Come and turn back time with me and let’s get “Lost in the 50’s”. This time, the event will be held at a brand new 4* boutique hotel – VIVATEL – located at VIVA HOME, Jalan Loke Yew Cheras. The ballroom is grand and spacious, sound system is amazing, with ample comfortable indoor hotel car park (Charges RM1 for the first 5 hours and RM1 for subsequent hour). Best of all, the hotel will be providing wooden dance floors for us who would love to prolong the lifespan of our knees and joints. 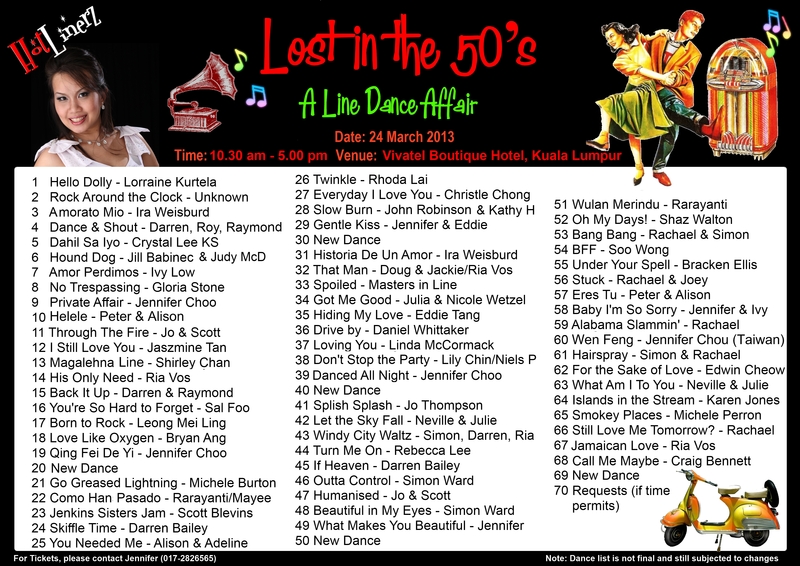 The dancelist is compiled from several dances from the famous songs in the 50’s on top of the current top hits that we’re dancing to. For outstation guests who wants to stay overnight in KL, you may want to consider staying at VIVATEL itself at a cheaper rate of RM180/night (normal price RM230/night). Limited number of rooms available at this price only, so please let me know asap. p.s. Just in case the GE falls during this weekend, the event might be postponed to 30 March 2013 (Sat evening) for a dinner event so we will all get to exercise our citizenship rights.